Join us on a very special wilderness yoga retreat weekend. Spend two nights getting away from it all practicing yoga, forest bathing, unwinding, and reconnecting with the natural world. We’ll bring the tents, the cozy campfire, and amazing yoga instructors. You’ll bring a heart ready to receive the gift of renewal from the natural world through community with other outdoor women. Come unplug with us and return renewed, relaxed, and rekindled. The Cascade Mountain Adventures team is thrilled to offer a very special wilderness yoga retreat. We believe in the power of nature to restore our hearts, minds, and souls. We can think of no better way to experience this gift, and reconnect with nature, than a weekend yoga retreat outdoors. You will spend two nights in a beautiful Washington State Park deepening your yoga practice, forest bathing, participating in relaxing guided meditation, and breathing in the forest air. You will have the opportunity to practice yoga outdoors, walk barefoot through the forest, participate in optional focused workshops, contemplate your place in the natural universe, make new friends, and so much more. Our three-day Wilderness Yoga Retreat includes two nights under the stars, focused workshop opportunities to deepen your yoga practice, invitations to participate in guided mediation and natural contemplation sessions, or the gift of uninterrupted time outdoors. This retreat is designed to offer as much or as little as you feel moved to participate in. You are welcome to dive in to all offered activities or indulge in quiet personal time watching the trees sway in the breeze. The Cascade Mountain Adventures team will provide meals, group and participant tents and shelters, overnight camping gear, firewood for the community campfire, and yards and yards of magical twinkle lights. You will also enjoy new friends, amazing old growth trees, a beautiful flowing river, and time spent in our private wilderness group camp. Our goal is to to create an opportunity to reconnect with nature, practice self care, and return restored, relaxed, and renewed. Holly's main passions in life are to find presence and balance in every moment, while simultaneously continuing to push her own limits, challenge her own perspectives, and continue asking "what else is possible?". Her yogic passions are to bring the gift of yoga, meditation, and mindfulness to anyone looking to find a place of calm and balance that they can come to within their daily lives, especially those who might otherwise feel that yoga is inaccessible to them for any reason. She personally first came to the practice of yoga as a way to cope with pain and illness but soon found that the mental benefits and philosophy of yoga were what really fascinated her. She had finally found a peace and quiet from the endless chatter in her mind and it kept her returning to the mat over and over again. Eventually, her quest for knowledge and expansion of her practice led her to earn her RYT-200 in 2017. And, soon after that, to study Yin Yoga under Dr. Patti Shelton in 2018 and become Trauma Informed Yoga Certified by Yoga Behind Bars. She has helped lead international retreats, as well as posture, and philosophy workshops and is looking to expand her offerings soon to include Myofascial Release and Thai Yoga Massage. Off the mat, Holly likes to spend as much of her time exploring the outdoors as possible, especially with her partner and two pups, Edna and Gustav. She finds that her yoga practice and her practice of spending time in nature find beautiful ways of interweaving that presence, balance, and mindfulness she so often desires, while also giving her great ways to continue push her limits and reach literal new heights! She is also a hobby photographer, woodworker, mala maker, and overall crafter. 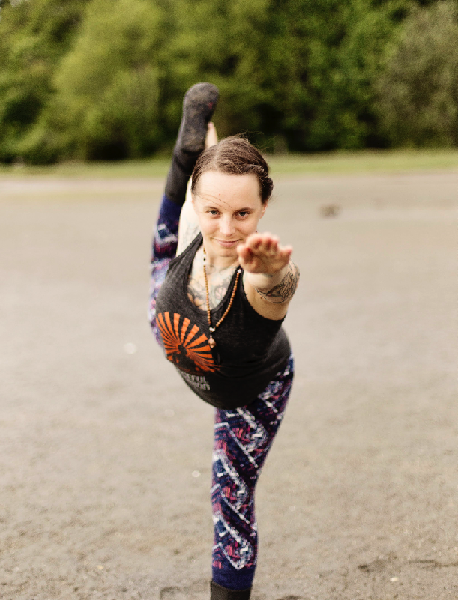 Jessica is a heart-centered connector who creates yoga classes for all experience levels that are loving, supportive, and accessible for every body. Each journey is unique, but you will likely experience healing sounds and music, invitations to go deeper, opportunities to explore your breath, a strong sense of community, guided relaxations, and a whole lot of laughter! After receiving the many physical, mental, and emotional benefits from her personal yoga and meditation practice for over a decade, Jessica decided to follow her heart and share these transformative gifts with her community. She completed her 200-hour teacher training at Bhumi’s Yoga & Teacher Trainings while living in Ohio in May 2014, where she studied six styles of yoga, including Iyengar, Kripalu, and Amrit Yoga Nidra. After moving to Seattle, she complete her iRest Yoga Nidra Level 1 Certification as well as her Yoga Behind Bars Yoga Teacher Training. Jessica is also a student of energy medicine and is Healing Touch Program Level 2 Certified, enabling her to offer hands-on energetic healing and assistance during her classes and workshops. She lives in Shoreline, WA, with the love of her life and their pet parakeet, Bogey. When not teaching or practicing yoga, you can find her photographing the PNW wonderland, geeking out on essentials oils, crystals, and tarot, and creating art, food, and bad puns with her amazing friends. This experience is designed to create the space to unplug, relax, and reconnect with yourself and your place in nature. We believe in the power of nature to restore our hearts, minds, and souls. We can think of no better way to experience this gift, and reconnect with nature, than a weekend yoga retreat outdoors. Come into the woods and reground yourself on the forest soil. The practice of yoga and meditation outdoors is powerful medicine. Our goal, and those of our incredible yoga instructors, is to create an experience of gratitude, contemplation, relaxation, and reconnection. This weekend experience will include sunrise gratitude yoga sessions, afternoon flow and restorative practice, guided meditation, and optional workshops focused on specific areas of your yoga practice. (crow pose anyone?) We will also provide common areas focused on activities from cozy silence & contemplation to community campfire sessions. Our objectives include deepening our yoga practice, focusing on self-care, re-discovering the restorative power of nature, and re-connecting with our practice in the natural universe. We are all beautifully in this together. The Cascade Mountain Adventures team has years of experience leading safe and successful outdoor adventures. Our three-day Wilderness Yoga Retreat is a once-a-year special event and near and dear to our hearts. You will be in great hands with an experienced team, incredible yoga instructors, and a safe and supportive environment. This event will be held in a rustic outdoor group camping environment. Overnight lodging will be provided in either a shared tent or open-air bunkhouse. All yoga practice will also be outdoors under the canopy of trees on the forest floor. Overnight gear - tents, sleeping bags, sleeping pads, and camp chairs - will be provided for this event. (but you are welcome to bring your own gear if you have it!) Backcountry meals - breakfast & dinner - are also provided and dietary restrictions can be accommodated with advance notice. Full bathroom facilities and showers are also available on-site. Please be prepared to spend the duration of the Retreat outdoors. You will meet in a beautiful Washington State Park on the evening of the first day, get to know your group, and settle in for a beautiful weekend outdoors. Your leaders will review your itinerary, provide an orientation of the area, and make sure you have everything you need. Welcome to the Retreat! You will meet at the group campsite location as schedules allow on the first evening. We ask that all participants be onsite by no later than 7:00pm. Your leaders will lead an initial logistical overview before hosting an area orientation of our group site. Your tent or open-air bunk will be ready and waiting a short walk away from our central community and practice areas. You will settle in to your home for the weekend before returning to the community campfire site, burn bans permitting, to participate in an opening group intention setting session. Your first evening will end with a short guided meditation around the campfire followed by s’mores and social time. You are expected to provide your own dinner this first night and/or eat before you arrive. Your wilderness guide will review the essential skills for staying warm and comfortable in your tent or open-air bunk overnight and wildlife safety protocols. (no accidentally feeding the raccoons your granola bars) A clear night will also allow for stargazing before tucking in to your warm sleeping bag. You will be sharing your tent with another amazing woman and, hopefully, a great new friend. Your second day will begin bright and early. The coffee and/or hot water for tea will be ready in the group kitchen shelter. We will begin this first morning together with a gentle Flow practice followed by a group breakfast in the community shelter or around the campfire. The day will continue after breakfast with a short (optional) group hike. We will explore the woods, river, and natural spaces around our group campsite and take the opportunity for silent contemplation of these special places. The late morning will include a nature focused guided meditation practice before transitioning into an energetic flow yoga practice on the forest floor. We encourage you to put your hands and feet on the forest floor as conditions allow. A group lunch will be served at the conclusion of this energizing flow yoga practice session. You will then enjoy free time following lunch to further explore the area, enjoy time by the river, take a nap, or curl up in a community tent with a blanket and a good book. The group campfire will also be available and inviting should you choose to spend time with other retreat participants. You are encouraged to do whatever your heart desires during this time. The group will then re-gather to participate in yoga pose intensive workshops, if desired, or guided nature contemplation and meditation sessions. These focused sessions will be followed by a group Yin and Yoga Nidra Practice before dinner. Dinner will be followed by a group discussion and sharing circle around the campfire and more s’mores (yes s’mores!) before an optional short night hike to the river bank. Participants are invited to stay up as long, or not at all, as desired. This is your time. Your third day will begin bright and early. The coffee and/or hot water for tea will be ready in the group kitchen shelter. We will begin this second morning together with a gratitude Vinyasa & Yin practice followed by a group breakfast in the community shelter or around the campfire. You will then join your retreat family around the campfire for closing ceremonies, experience sharing, and preparations to rejoin the world at large. It will then be time to head home restored and renewed with a heart full of joy and gratitude. Expect to depart at around 10:30am.